This past Wednesday evening, the Franklin & Marshall Men’s Soccer team hosted their annual Smith-Herr Boot game against Elizabethtown on Tylus field, clenching a 5-1 win, and, once again, bringing the boot back home to F&M. The annual “Battle of the Boot” began in 1977 and has been played each year since. The Smith-Herr Bronze Boot is a soccer shoe originally worn by Al Hershey, a two-time all American at Elizabethtown and, later in his career, a coach at both Elizabethtown and F&M. The boot is named for Robert Smith, who coached at F&M from 1947 and Ira R. Herr, who coached at Elizabethtown from 1938-48 and 1958-60 (godiplomats.com). Unbeknownst to a 5-1 Diplomat final score, tensions were high early in the game as the Blue Jays took a 1-0 lead only 11 minutes into the first half. With a determined and primarily offensive pair of counterattacks, a throw-in from F&M’s Steven Yakita into the box allowed F&M’s Connor Whitacre to score the first goal of the game for the Dips in the 37th minute. Entering the second half with a 1-1 score, the Dips continued to produce offensive opportunities and, in the 48th minute, take their first lead of the game with a goal by F&M’s Ryan Fincher off of a foul in the box. Putting themselves in optimal scoring positions, F&M continued to add to the score when, in the 65th minute, F&M’s Jim Connolly sent a cross into the box that F&M’s Alex Lalovic was able to capitalize on, with a sliding shot on net. 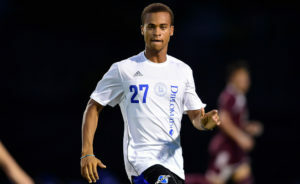 First-year defender, F&M’s Dallen Moore, scored his first career goal in the 74th minute of the game, capitalizing on a loose ball from outside the box, sending a low strike through the defense and into the bottom right corner of the net, bringing the score to 4-1. And as if four goals weren’t enough, with just five minutes left in the game, F&M’s Jack Brandt scored from a shot on goal 15 yards out on a pass from F&M’s Magnus Parente, securing a Diplomat win and the return of the boot. The Dips improved their record to 5-0–their best start since 2015–and the Blue Jays fell to 0-4-1. F&M Men’s Soccer returns to action on Saturday with a 7:00 p.m. conference game against Muhlenberg.